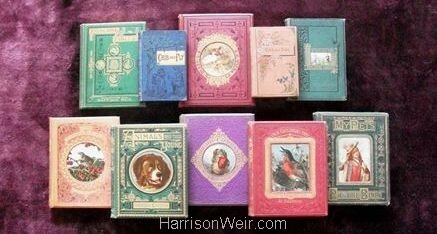 The Resource Library is comprised of predominantly 19th century books or hard-bound periodicals that are either fully or partly illustrated by Harrison Weir. Some may contain rarer, or even one-off examples of his work. A large number of the images that populate our image database, come directly from these publications, while secondary images are resourced from individual 19th century periodical prints and book plates, often that have been sourced from sellers who have taken them from “breakers”, (old publications that have been broken down and divided for resale). These individual prints and book plates are stored in both a physical and electronic archive. It is our preference to obtain the images or book plates “in situ”, as this provides essential provenance and often a context that is not wholly apparent when sold separately. Often the original books contain advertising and relevant material notes about both the publisher and author, that have a bearing on the stories behind the images themselves. The Library is added to on a daily and weekly basis, as we search for specific material. From time to time we will use this page to advise readers and followers of the work of Harrison Weir, of new or recent acquisitions or donations to the Library and whether any of the images have been rendered available as prints in our themed Galleries. 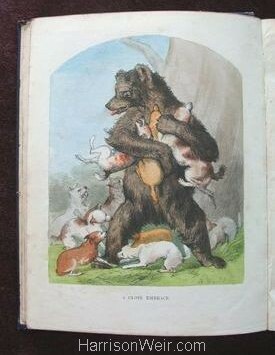 Published in 1853 by Addey & Co, this is a delightfully hand-coloured edition of Alfred Elwes book, “The Adventures of a Bear – And a great Bear too”. It is illustrated solely by Harrison Weir and contains 9 illustrations, of which 8 are full page and are hand-coloured as in this example, shown directly from the book. 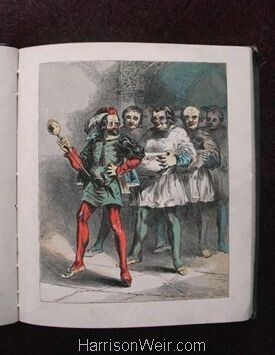 Published in 1846, by Jeremiah How, this is a rare hand-coloured edition of a fairy-tale book by Alexander Dumas, entitled “The Honey Stew”. It is translated from the french, by Mrs Cooke Taylor and is a very early example of the burgeoning illustrative style of a very young Harrison Weir, who was only 22 yrs old at the time. This image is taken from a page of the October 1854 issue of “Punch”. 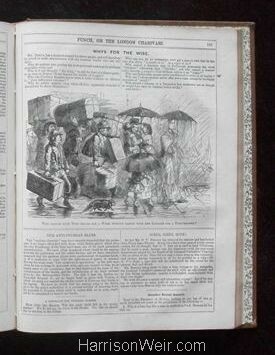 It is representative of an incident when Harrison Weir was called upon by Mark Lemon, to illustrate for that famous magazine, due to the illness of the regularly employed illustrator, John Leech. Fortunately, Mr Leech’s indisposition was short-lived, so this remains the only illustration on record produced for that publication, drawn by Harrison Weir. 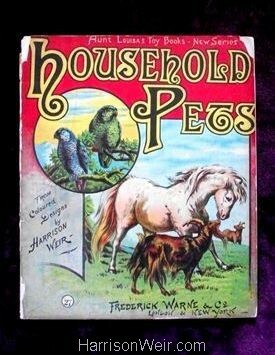 Published by Frederick Warne & Co, Circa 1874. This rare children’s booklet contain six full page chromoliths by Harrison Weir, printed by Kronheim. This edition is possibly from the Warne archives, as other later editions, published by both Warne and McLoughlin show changes to the “Cat” Chromolith after this period. 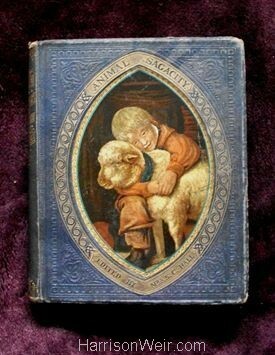 Published by S.W.Partridge in circa 1866, and edited by Mrs S.C.Hall, this is a delightful childrens book on anecdotes of animals and their sagacity. 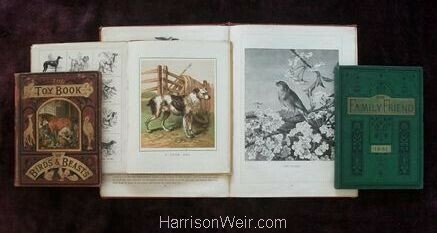 It contains no fewer than 24 drawings by Harrison Weir, dating between 1862 and 1866. Many of the Partridge’s Children’s books were prize winners at the International Exhibition of 1862. 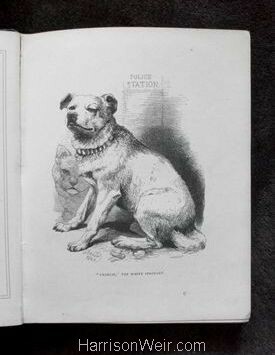 The above shows just one of the images from “Animal Sagacity” edited by Mrs S.C.Hall shown at left, this one being the endearing story of “Charlie”, The White Sergeant, who as an old starved homeless dog, was adopted by the constables of the Bow Street police Station. It relates his remarkable story and many astonishing achievements.